Last Tuesday night I took a chance and responded to a "cake wanted" ad on Craigslist. 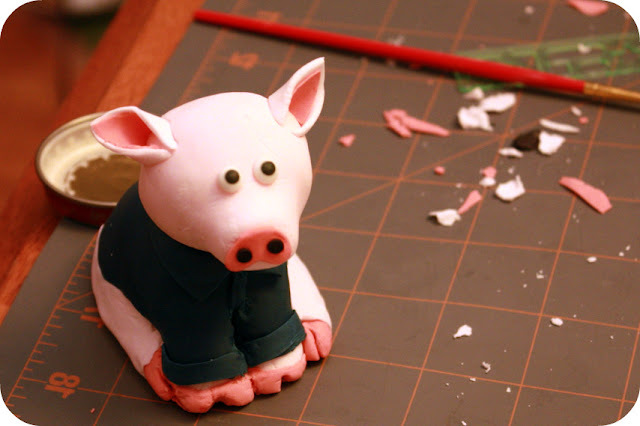 Michelle was planning a surprise pig-themed party for her husband who was graduating from the Police Academy and was looking for someone to make a cake for the big event. Having never made a cake for someone I didn't know before, I wasn't sure if I'd have a chance at scoring the gig but decided I would try anyway. When I wrote to Michelle I explained that I wasn't a professional baker, just someone who loved to bake and included a link to my blog. Within about a half hour she wrote me back and said the job was mine. Woo hoo! Michelle's had two requirements: the cake had to convey a pig/police theme and it had to be chocolate. Her exactly words were: "Derek LOVES chocolate. His ideal dessert is chocolate cake with chocolate sprinkles, with chocolate ice cream, with brownies, drizzled with chocolate syrup, with a side of whip cream." So chocolate is what she got! I decided to go out and made a chocolate espresso cake filled with bittersweet chocolate ganache and frosted with chocolate Italian meringue buttercream. I'm not a big chocolate fan but I have to say that the buttercream was dreamy and it was super decadent. And although it was chocolaty, it wasn’t too over the top. It's definitely a keeper! 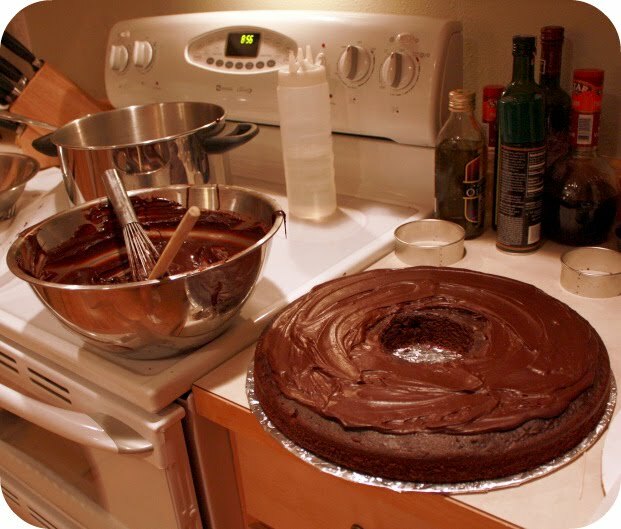 I've always found ganache to be a tricky medium with which to fill a cake. This is because to achieve a substantial layer of it, you have to get the temperature just right. If it's too warm it will literally drip right off the cake and if it's too cool it will solidify to the point where it's not spreadable. So what to do? 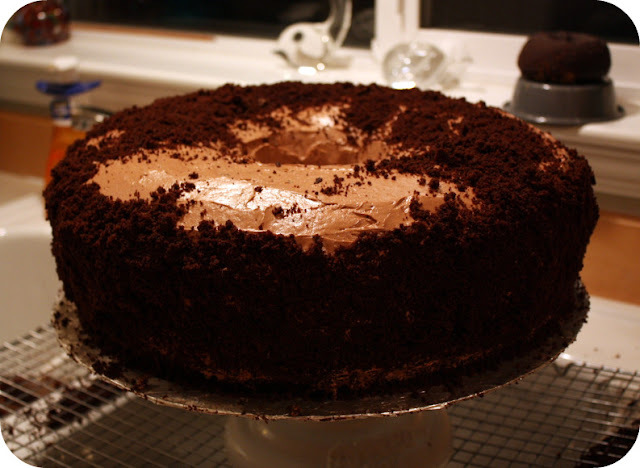 I found that if I spread a thin layer of ganache on the cake and gave it a moment to set, I could easily add another layer without worrying about it dripping. I did this three of four times until I got the nice thick layer of ganche. I'm sure there must be a better way to this, but this is what worked best for me. I wasn't sure what to use to cover the cake. At first I thought about using fondant or even Oreo crumbs but knew the flavors would detract from the sincere chocolate goodness the rest of the cake boasted. So instead I decided to repurpose the leftover cake crumbs to coat the outside of the cake. As I carved the donut shape out of the cake, I saved all the crumbs and pieces I could and then frozen them briefly to firm up. I then ran the crumbs through a food processor in small batches and lightly pressed handfuls of the crumbs into the cake's surface (Tip: When I did this, I placed the cake on a large cooling rack over the sink. This made clean-up a lot easier!) My only gripe was that I was running a bit low on crumbs. If I had about 2 more cups, I would have had a more even texture. Overall though I was very pleased with the outcome. Divide the batter evenly between the cake pans. 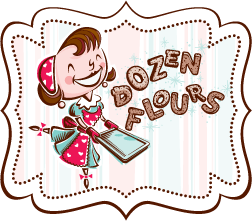 For 9-inch cake pans, bake 1 hour or until a toothpick comes out clean; for half-sheet pans, bake 45 minutes or until a toothpick comes out clean; for cupcakes, bake 20 to 25 minutes, or until they spring back after being touched. 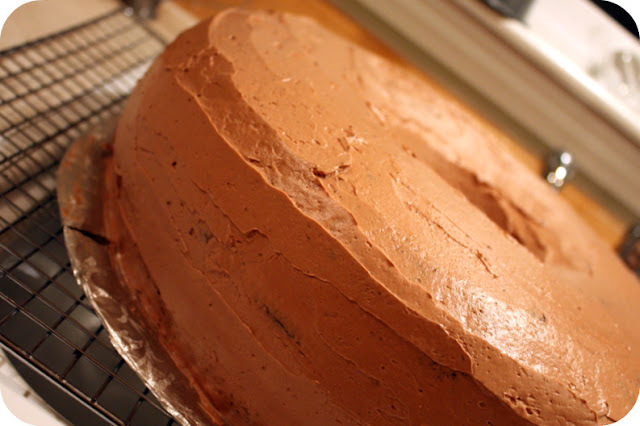 For this specific cake, I used the entire recipe to make one layer of cake in a 14" pan and baked it for 25 minutes. Whisk it until it is smooth and no lumps appear. Combine 3/4 cup sugar and the water in a small saucepan and stir until the sugar is dissolved. Slowly heat the mixture, stirring constantly, until it starts to bubble. 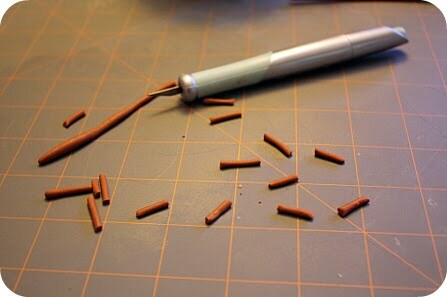 Reduce the heat to low and insert a candy thermometer. Do not continue to stir. Using a whisk attachment, beat the egg whites in a large mixing bowl on medium speed until foamy. Add the cream of tartar and beat at high speed until soft peaks form. Gradually add the remaining 1/4 cup of sugar and beat until stiff peaks form. Meanwhile, boil the sugar mixture until it reaches 248-250 degrees. DO NOT LET THE TEMPERATURE EXCEED 250 DEGREES F! Remove from the heat and immediately pour the hot sugar into a glass measuring cup to stop it from cooking. 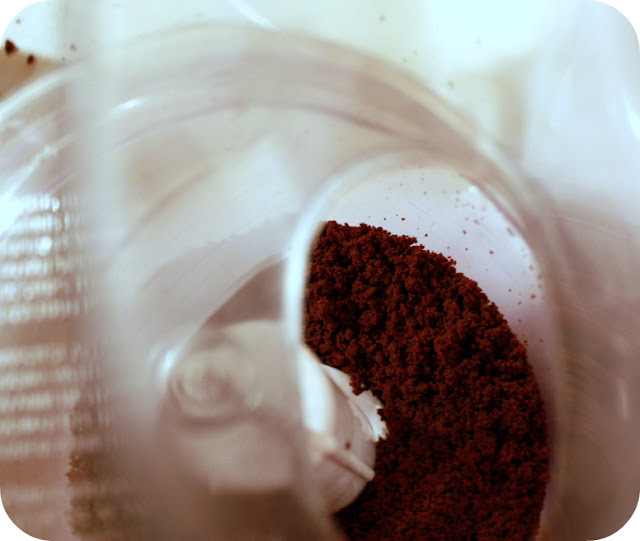 Turn your mixer on low speed and slowly pour a little of the hot sugar into the bowl. Slowly add the remaining sugar. Beat on high speed for minutes, then reduce to low until the mixture is cool (you should be able to place your hands on the sides of the mixer bowl and not feel a substantial amount of heat). This should take about 3 minutes. Add the cooled (do not add hot melted chocolate as it will ruin your buttercream!) melted chocolate a few tablespoons at a time and whip on high for 30 seconds or so until it's combined, scraping down the bowl as needed. Spread on the cake immediately or store in a covered container in the refrigerator for up to a week. Yield: 4 1/2 cups of buttercream This little guy was about 4 inches high and made out of Rice Krispy Treats and gum paste. I used a 14 inch cake pan to make the cake, it was about 6 inches tall and it weighed 37lbs! Your little piggy is so cute and that cake sounds fantastic. How did he like it? Did she let you know? That is so funny...and adorable! good for you for branching out, julia! i daresay you've done so in a ridiculously impressive manner. that pig is the cutest thing i've seen all week. this is absolutely amazing & such a fun idea! i stumbled across your blog awhile ago and absolutely love seeing what recipes you come across. Julia: The cake was PERFECT! Everyone at the party loved it! I could eat that ganoush for breakfast, lunch, and dinner! The detail you put in the badges was amazing! Thank you! OMG – he’s adorable!!! Lol! Too cute! Love the tail – and love the huge donut!! I know it’s not what you envisioned originally – but that’s so cool!! I’m sure they were thrilled. CAKE WANTED ad?! Whaaat?! That's awesome! 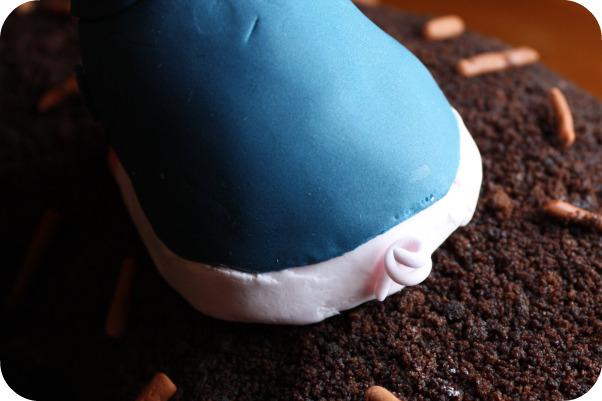 Great cake, cute pig and kudos to you for taking a risk! Love it! Julia: I was at the party and the cake was a BIG HIT! Being a chocolate lover like the rest of the family, I can tell you that the filling was amazing. The detail on the pig was unbelievable. Thank you for sharing your creativity and talent. I laughed out loud when I saw the giant donut with the piggy! I'm sure the recipient was very happy!!! Love the little piggy! Too, too cute! your work isn't just pastry, it is art. Nice job! That looks so good! I love the little piggy. Actually I love the whole thing. Umm . . . not a professional? I think you are! What a fun ad to find! And I bet she was thanking her lucky stars you came across it. The cake is adorable. 37 lbs?! Wow. Absolutely amazing! That pig is hysterical! That cakes looks delicious! Here's a tip for your ganache filling---if you let the ganache cool to room temp and then whip it a little in your mixer it becomes a thicker, frosting-like consistency. It's fantastic. Give it a whirl! I am completely in love with the little piggie! That cake is SO cute! I love it - very impressive! Hey..i luved the little piggy so damn cute. Hahaha I love how you made this cake!! I'm sure they must have been super happy!! Ganache is a little tricky, and I do the multiple layers thing too!! 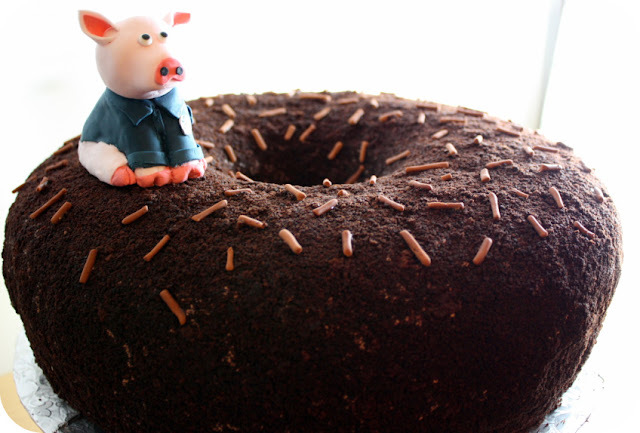 The cake is totally decadent and the pig , just to cute! I love this cake, it is absolutely adorable. Awww, that is about as cute as a heard of baby ducks! You are a very talented cake decorator! Sour cream and yogurt - are they interchangeable or is it a typo in the recipe? Sorry about that -- it's sour cream. Not sure where that came from... hm! Hey Aunt Julie :) It's Mollie. I look up to you as a baker. I love baking. & I hope I can be as good as you one day. I'm definitley going to bug Mom about letting me try this cake. :) Love you.